Thandiwe Soetsang matriculated at Nkgopoleng Secondary School in Zamdela and started her tertiary education at Sefikeng Teachers College in Qwaqwa where she completed her Primary Teacher’s Certificate. Mrs. Soetsang furthered her tertiary education and completed her Diploma in Education at UNISA. She then registered for a BED (Honours) at the North West University and completed it in 2005. Mrs. Soetsang started working at Refengkgotso Primary School from 1985 – 2009 as a foundation phase teacher. She was deployed as a part time councillor at Metsimaholo Local Municipality in 2000 and she then became a ward councillor in 2005. Mrs Soetsang was also seconded as a Metsimaholo Local Municipality Councillor in the Fezile Dabi District Municipality from 2005 until present. 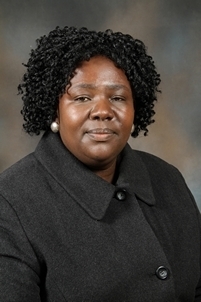 Thandiwe Soetsang has occupied various leadership positions in the ANC and the ANC Women’s League at both branch and regional level .She is currently a member of the ANC REC Fezile Dabi Region and the Chairperson of the ANC Women’s League Fezile Dabi Region.